Note this article has been updated since first published on July 12 as we now have height and weight data and at least one change with David Meli into the team). Defending champs Papua New Guinea have named their squad for IC11. Many things jump out as most obvious about the list - its youth yet experience, lack of height and wide spread from across PNG. 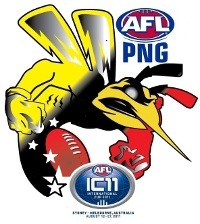 10 players are under 19 with 2 sixteen year old boys from the AFL Academy in Port Moresby. Only 5 players are 25 or older. Bruce Savare (36) and Nicholas Apamumu (35) will no doubt get plenty of good natured teasing from the teenagers in the team. The average age is only around 21 years. In terms of height it has often been the Mozzies' Achilles heel, and while they are slowly unearthing taller talent it remains an issue when they come up against teams of similar talent. At 194 cm a key player could be Tiernan Carbry (only about to turn 20 and yet returning for his second International Cup), yet he has been named as an emergency. 5 cm (2 inches) taller than any team mate, it looks like PNG's onballers will once again be deprived of first tough in many ball ups. In some ways they will have to be significantly better than their opponents and against sides like New Zealand and a resurgent Ireland that could be a big ask. Perhaps two of PNG's best, Donald Barry (Brisbane Lions listed) and David Meli (Essendon international scholarship player) were thought to be unavailable, but Meli has now been named (Barry is injured and possibly unavailable anyway). The list is still formidable with 17 players returning from IC08 and a swathe of young guns backing them up. They will surely make the top 4 and probably start favourites to go back to back, with the height issue the main nagging doubt. Love the new Mozzies logo. There's some great artwork coming out for IC11. Mozzies' cup hopes boost preview from The National.